PINEVILLE, La. 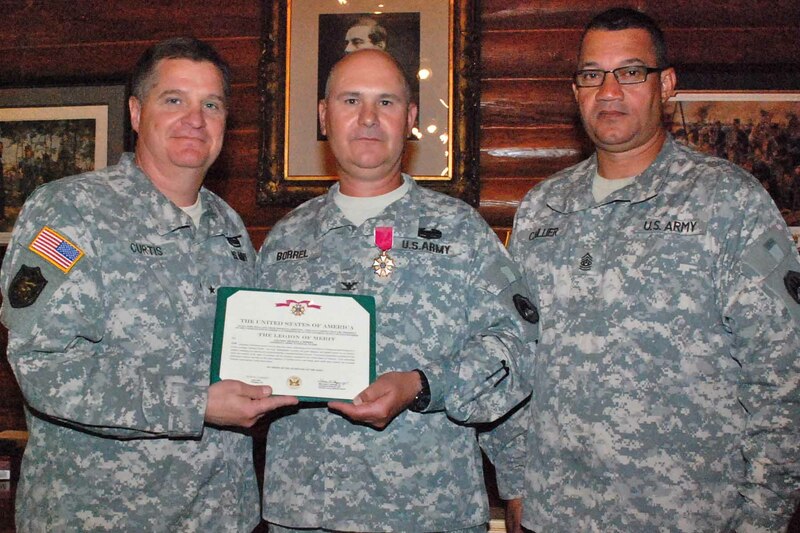 – Friends and family celebrated Louisiana National Guardsman Col. Michael J. Borrel’s 34 years of service at a retirement ceremony at Camp Beauregard in Pineville, April 21. Borrel graduated from Marksville High School in Marksville, where he grew up and currently resides. He enlisted into his hometown unit in 1977 and went on to receive his commission in 1982 from Louisiana’s Officer Candidate School. Borrel graduated from Northwestern State University with a bachelor’s degree in general studies before earning a master’s degree in strategic studies from the U.S. Army War College. Borrel served as company commander for B Company, 527th Engineer Battalion, in Marksville, and he said it was an honor to have the opportunity to assist people locally and around the world. He especially enjoyed construction projects that allowed him to serve in his hometown, including building a ball park, as well as overseas missions to Panama and Honduras, where he oversaw the building of roads and bridges. “Our engineer missions gave something positive back to the community and gave the Soldiers something to be proud of as well,” he said of the engineer efforts. Borrel served in prestigious positions in the Louisiana Guard, including battalion commander of the 199th Forward Support Battalion, director of oil field reconstruction in Iraq and commander of Task Force Kout Men, the 500-member training exercise to Haiti that constructed four new schools and conducted 10 medical readiness exercises. Borrel also served as the director of joint personnel and manpower for the last five years. Retirement will not slow Borrel down as he has been named as the director of educational programs for the Louisiana National Guard which oversees three Youth Challenge Programs at Gillis W. Long Center in Carville, Camp Minden in Minden and Camp Beauregard in Pineville, as well as two STARBASE programs located at Jackson Barracks in New Orleans and Camp Beauregard. Borrel said his long and successful career would not have been possible without the support of his wife, the former Jacqueline Hines. Borrel has received numerous awards during his career, some of which includes the Federal Legion of Merit, Meritorious Service Medal, the General Douglas MacArthur Leadership Award, Louisiana War Cross and was awarded the Combat Action Badge. Borrel is a member of the Marksville Lions Club and serves on the City of Marksville Civil Service Board. He is the proud father of two children, Dustin and Vanessa, and has two grandsons, Gage and Peyton.